Q: Will Melania Trump keep her husband from sending controversial wee-hours tweets? A: Probably not. The two are said to have remained in close contact while living apart, speaking several times a day, and she has a history of giving him advice on his image. But President Donald Trump has been steadfast in making his own decisions about social media, overruling advice from aides. Mrs. Trump described their dynamic last year in an interview with the luxury magazine Du Jour. "I give a lot of advice to my husband and tell him how it is and how I see it. I'm not backing off. I tell him the truth," she said. "After a speech, the kids are calling me - Ivanka, (his) sons - saying, 'Call Dad and tell him this and that. He's listening to you.' They know I would talk to him and put him in the right direction. Sometimes he does, and sometimes he doesn't. He will decide what he does." Q: Will she build an advocacy program, such as Michelle Obama's "Let's Move" or Laura Bush's National Book Festival, or undertake any restoration projects in the White House? A: Mrs. Trump has been slowly raising her profile since generally lying low in the first weeks after inauguration, when she made no public appearances and made little progress hiring a staff. Now she has a small team in the White House and plans to make a few more hires, according to her spokeswoman Stephanie Grisham. However, it is unlikely that her staff will be as large as those of her recent predecessors. Mrs. Trump has said she plans to focus generally on women and children, and during her husband's campaign she gave a speech saying that she wants to advocate against cyberbullying among children. But she has not yet launched any specific programs or initiatives. That's not so unusual: White House veterans note that other first ladies have taken a few months to firmly establish their areas of interest. Michelle Obama began her campaign against childhood obesity about a year into her husband's administration. Mrs. Trump has cited Jackie Kennedy as a model first lady and has been borrowing books from the White House Historical Association. She hired an interior designer to prepare the White House residence for her move and may select one of the public areas of the White House to renovate. Already, she added the White House movie theater to the public tour. 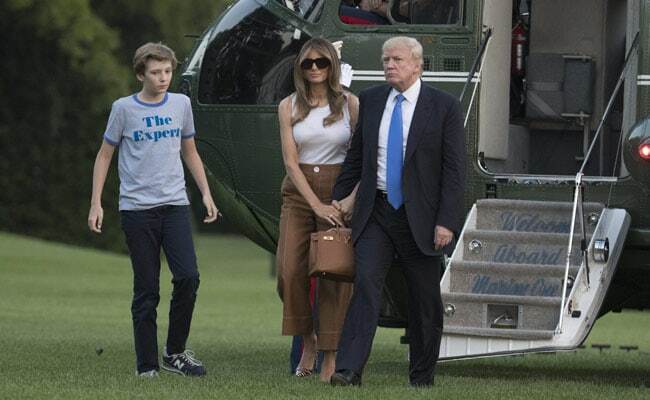 Q: How will Barron Trump's presence change life in the White House? A: Friends have described Mrs. Trump as a "fierce" mother, and she said she delayed her move to Washington so that Barron - who will be the first boy to live in White House since John F. Kennedy Jr. - could finish out the school year in New York. She typically dropped him off at school, a routine that was relatively unbothered even after the inauguration. Washington may prove different. Traditionally, reporters who cover the White House have considered stories about the president's minor children off-limits unless their parents are directly involved. But presidents often find it politically helpful to showcase their familial ties, pulling the spotlight ever closer to the children: Barack Obama sometimes name-dropped Sasha and Malia in political speeches, and the arrival of their pet dog, Bo, became a major family photo op. In an interview with Bloomberg News earlier this year, the president called the White House a "cocoon" that he thought would be good for his son. That statement seemed to indicate the Trumps will be protective of Barron, though it wouldn't be surprising if he accompanied his parents at traditional events, such as the arrival of the White House Christmas tree and the annual pardoning of the White House turkey, as he did earlier this spring for the Easter Egg Roll. Q: Will Melania Trump engage with D.C.'s social scene? A: The first lady has never been a social butterfly, preferring to spend evenings at home, whether in Manhattan or Washington. But she has shown an interest in entertaining, hosting events at the White House for the nations' governors, members of Congress and their spouses, and "Gold Star " families. She was at her husband's side for a gala performance at the historic Ford's Theatre earlier this month - their first foray into Washington's social scene beyond the gates of 1600 Pennsylvania Ave., an appearance that gave the city's social-scene watchers hope that the Trumps might go along with at least some of the rituals typically expected of a first couple. Q: How will Melania Trump leave her mark on the job? A: Well, for starters, she has already distinguished herself as the only first lady in the nation's history to delay a move to 1600 Pennsylvania Ave. Many modern first ladies have tried to change the role, which critics have said is rooted in hidebound notions of woman's role in society. After she left the White House, Laura Bush questioned whether first ladies - who receive no salary - should have to leave their jobs and professions to take on the traditional role. As first lady, Hillary Clinton set up an office in the West Wing and oversaw the Clinton administration's attempt to overhaul health care, an involvement in policy that drew sharp criticism. Whether or not she breaks with other first lady traditions, not moving to Washington right away may end up being the most transformative thing Mrs. Trump does.